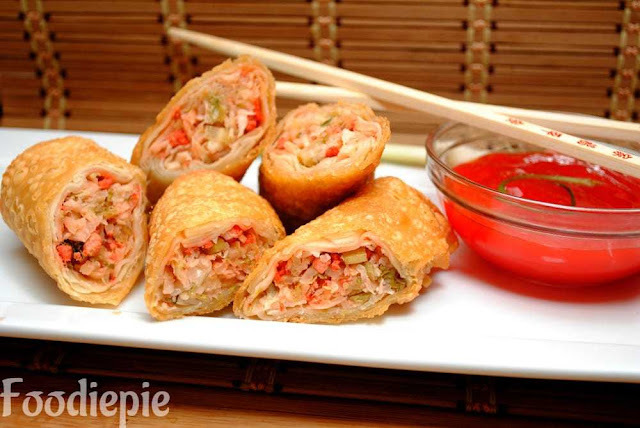 Vegetable Spring Rolls is one of the most popular Chinese snack recipes prepared with fresh vegetables and spicy spices. To prepare this vegetarian Spring roll recipe, you just need some simple ingredients. Children are also enjoy this recipe all the time and you can pack it to your child lunch box. We use in this recipe green veggies and less spices.This is healthy snack.If you love a particular seasonal veggie, you can also add your own turn of material to make this recipe interesting and for more delicious you can add cheese as well. The best way to prepare is your way, in which you can add spices to your liking. So, try this delicious recipe at home.Let'checkout recipe first. Step 1 : Take a big bowl Filter the maida wit sieve, Add water to prepare batter smooth and thin consistency for making the wrappers. Cover the batter and keep aside for 1 hour to rest. Step 4 : Pour 1 teaspoon batter on the Tawa and spread evenly in the circular motion behind the pedal spoon. Keep it thin to make the roll crisp. Step 5 : Cook it over low flame to prevent over cooking.When you see the changes on the surface of the wrapper and it starts to separate from the corners. Take it off from Tawa and place on Greased plate.Wrapper is ready now prepare all wrappers in same way. Step 6 : Now take cooked wrapper and add Mixture in wrapper and top up with 2 teaspoon of mixture.Fold the wrapper from all sides and cover the stuffing completely. Prepare all the rolls like that. Step 7 : Heat a tablespoon of oil in a pan and put 3/4 spring rolls in the oil and fry them to 5-6 minutes or until they turns light brown then transfer fried rolls to plate. Step 8 : To remove excess oil from spring rolls, keep the spring roll on kitchen towels. if you want deep frying then fry again for 2/3 minutes. Finally : Crispy Vegetable Spring Rolls is ready.Transfer to serving plate and serve with spicy chilli sauce or tomato ketchup.